April 21, 2016 April 21, 2016 Pilar B. Many parents like to help feed or dress their children, even when the children become capable of doing it on their own, because they feel it’s a way of showing love. While parents who follow the Montessori philosophy understand that it’s important to support their child’s budding independence, they sometimes don’t know how to channel their affection in a way that’s helpful to their child’s development! You’ll be happy to know that in the Montessori philosophy, you – the parent – play a very important role… Click here to find out what this role is and watch a short video. April 15, 2016 Pilar B. March 11, 2016 March 25, 2016 Pilar B.
I know you have the best intentions. When you take me to the park and “walk” me by the arms, sit me on the teeter-totter, or send me down the slide, you’re doing it because you want me to have fun. But here’s the thing: I am a baby. I am driven by developmental urges you can’t see. The things I want to do may seem slow and boring to you, but they are exciting and challenging to me. When you push me to do what you think is fun, you rob me of the opportunity to do what I know is necessary. Believe me, when I’m ready to walk, I will (and you won’t be able to stop me!). When I’m ready to sit on the teeter-totter, I will (and I won’t want to get off!). When I’m ready to go down the slide, I will (over and over and over again!). But right now, I want to crawl. Or stand. Or chew on a stick. So, please respect me by backing off. Enjoy your latte. Bask in the sunshine. And let me do what I was born to do: become myself. February 25, 2016 March 25, 2016 Pilar B. If you’ve been following the Voila Montessori video series, you’ve probably had the opportunity to give several presentations to your child by now. She might have shown interest in some activities, and completely ignored others. Do you feel frustrated when that happens? All that hard work to put together the material, and your child isn’t interested in it! Find out why this happens and what you can do about it by clicking here! December 14, 2013 Pilar B. Warning: This post uses the word “poop”. A lot. It’s a post about toddlers and Montessori and early toileting awareness. You’ve been warned. There’s been some press lately about elimination communication (aka, early toileting awareness): the practice of identifying your baby’s signals for pooping and peeing and taking them to the potty to eliminate. The moms that are interviewed for these pieces (or at least the way the articles and videos are edited) make it sound like it’s a walk in the park: Your baby makes a funny sound, you put them over the potty, and they pee or poo quickly and peacefully. You soon develop a routine, and life becomes a crunchy diaper-free dream. I don’t doubt that some babies take to eliminating on the potty with ease, just like I don’t doubt that some infants start sleeping through the night at 8 weeks old. But for most of us, the path to our child’s toileting independence (just like the road to a full night’s sleep) is bumpy, winding, and often discouraging. The only way you and your child will develop a successful relationship around toileting is if your expectations are in line with reality. And the reality is that, in most cases, early toileting awareness requires A LOT of hard work, dedication, and patience. The first time I put Zach on the potty, at 7 months old, he peed. I was so excited, I took a picture of the potty and its contents and sent it to my husband. (Oddly, he was not amused.) I continued to “catch” a few pees here and there, but it took Three. Long. Months. before my son realized that poop also goes in the potty (which coincided with his ability to pull up to a standing position). And just because he understood where poop went didn’t mean it always made it there. He often waited until I helped him off the potty and then decided it was the perfect time to poop – on my hands, my pants, his pants, the floor, my shoes, his shoes, his blanket, a book… You name it, and chances are it has been covered in poop at some point. And the whole “communication” thing? Well, I was never able to identify a special cry, grumble or grunt, so I just set up a schedule around his naps and meals. Zach started communicating his elimination needs at around 14 months old (using sign language), but most of the time he would let us know AFTER the fact. As if the puddle around his feet wasn’t a clear enough sign. We used a combination of cloth diapers when we were at home and disposables for going out, until he turned one. At that point I sucked it up and replaced the cloth diapers with cotton training pants. And at around 15 months we dropped the disposables completely (for daytime). “You’ve saved so much in diapers,” my friends coo enviously. Yeah, um, no. What I’ve saved in diapers I’ve spent in pants (and detergent, and water, and electricity), because sometimes he’d go through seven pairs of pants in one day. Changing wet underwear? Not fun. Changing poopy underwear? MAJORLY not fun. Then comes the challenge of getting your child to sit – and stay – on the potty. The first few weeks were easy, but then the novelty wore off and Zach realized he could arch his back and refuse to sit. We tried books, singing, and toys. When he wanted to sit, he would stay on the potty for-freaking-ever. And when he was feeling willful, there was no power on earth that would change his mind. And then he’d pee and poop on me for good measure, before I had a chance to put his underwear back on! Then there’s traveling with the potty. And the dog who ate the poop from the potty. And hours on your knees singing “The Itsy Bitsy Spider” next to the potty. And ALL the people who think you’re nuts because your life revolves around a darn potty. But then one day, before your child is even two years old, it hits you. There’s rarely a wet pair of pants anymore. And when you’re stuck in traffic and your toddler needs to poop and you tell him to hold it until you get home… He holds it. And you see the quiet self-confidence that develops within your child when he is allowed to exercise his free will, experience consequences, and learn from them, all the while knowing that there’s a loving adult by his side, never judging, just waiting. And you realize it’s ALL been worth it. Every single stinky, poopy, knee-busting, back-breaking moment. Will I do it again if I have another child? In a heartbeat. Am I looking forward to it? Not so much. And there you have it: The truth about early toileting awareness. When it’s good, it’s very very good. And when it’s bad… It’s still worth it. November 20, 2013 Pilar B. 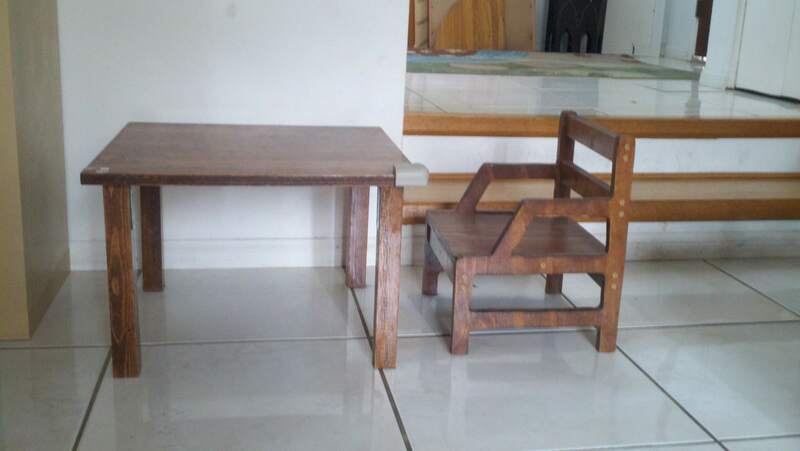 Recently I’ve been getting requests from readers for pictures and measurements for the weaning chair and table my husband built for Zach. 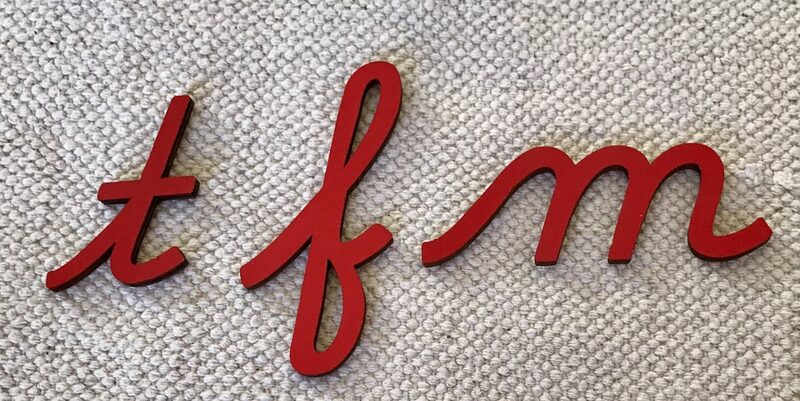 We got the measurements from a dear friend and Montessori consultant, Jeanne-Marie Paynel of Voila Montessori. She has graciously made these resources available to parents everywhere at this link. Please consider donating to support her efforts and help her continue to share her amazing knowledge. I hope this helps!! November 20, 2013 November 26, 2013 Pilar B. THEIR NEEDS AND ABILITIES CHANGE SO DARN FAST!!! AAARRGGGHHH!!! I spent almost two hours observing through a one-way window in my son’s Toddler Community. What I saw was amazing. And disconcerting. Because the environment I worked so hard to set up for my one-year old just a few months back? Yeah, completely useless now. My baby, the one who was content shaking a maraca or drooling over a plastic lion, is now a capable almost-two-year-old who makes his own orange juice, slices cucumbers, washes dishes, paints, draws, pastes, sews, strings beads… The list is endless! With Thanksgiving vacation around the corner, I’m going to make it my mission to slowly introduce new activities in our home. I promise to make time to share them here! First step: buy trays. Like the Primary environment, all activities are kept on color-coded trays. Unlike Primary, the activities are often performed within the trays. So, say the child is juicing oranges. The juicer, orange, bowl for the fruit, pitcher and sponge would all stay within the tray as the child works. 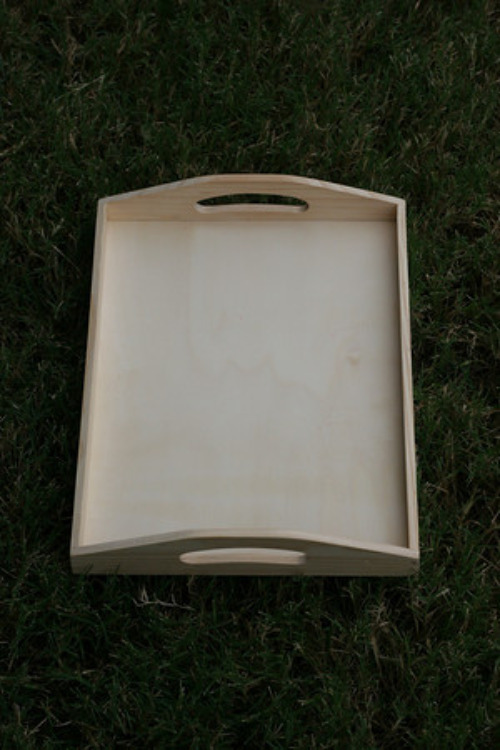 The trays should have handles on the sides for easy gripping and transportation. Thankfully, if you live in the United States you can take care of all your toddler tray needs at Michael’s! Guess where I’ll be this weekend? Unlike they do in the classroom, I’m not going to paint the trays; I’m going to stain them all the same color and then use colored electrical tape to line the exterior and a matching oilcloth rectangle to line the interior. This way, I can use the same tray over again for a different activity by simply changing the color coding! Electrical tape is great for anything that needs color coding: pitchers, buckets, glasses, brush handles, etc. Second step: make an apron. Zachary’s school uses this one, so I want to make the same model to support his sense of order and help him master one type of apron before moving on to other variations. I think I have a few yards of oilcloth somewhere, for the apron I was going to make him one year ago… Add one more project to my ever-growing list of Thanksgiving activities! So, there you have it – the truth about being a Montessori teacher/mom. Just because you know how it works doesn’t mean you have the bandwidth to keep up. June 20, 2013 Pilar B. Welcome! Come on in… I’m Zach and this is my home. I was born in my parents’ bedroom upstairs and have spent my entire life – a whopping 16 months – living here. I love what my parents have done with the place and I want to share my favorite spots with you. Let’s begin in the kitchen. When I started being strong enough to open the drawers on my own, my mom had to do some re-arranging. She moved all the chemicals to the bathroom (the only cabinet in the house with a child-proof lock). She put her glass tupperware in a higher drawer so I wouldn’t accidentally break it while playing with the other containers, and she moved the silverware (except the sharp knives) down to a low drawer so I could have access to it. Other than that, she left everything else as it was. A few times I tried investigating the delicate items she had in some of the drawers, but she would come over and tell me “no, those are not for you”. She would then show me which drawers I could play with. Now I know! I got my fingers caught in the heavy drawers a couple of times, but now I’m really skilled at closing them. My favorite item in the kitchen is my dad’s old blender. I spend hours assembling and disassembling it! Next to the kitchen is the little wooden cupboard where I keep my toys. My mom found it at a swap meet and I love it because it’s the perfect size for me! We keep my cars in one basket on the floor and my balls in another. Mommy says baskets are great, and I agree! I especially like to dump everything out of them and then put things back (or walk away and leave a giant mess behind, depending on my mood). Next to my toys is my weaning table. This is where I had my first meal with a bowl and a spoon! When I first used the table, at 4 months of age, I needed help sitting up. 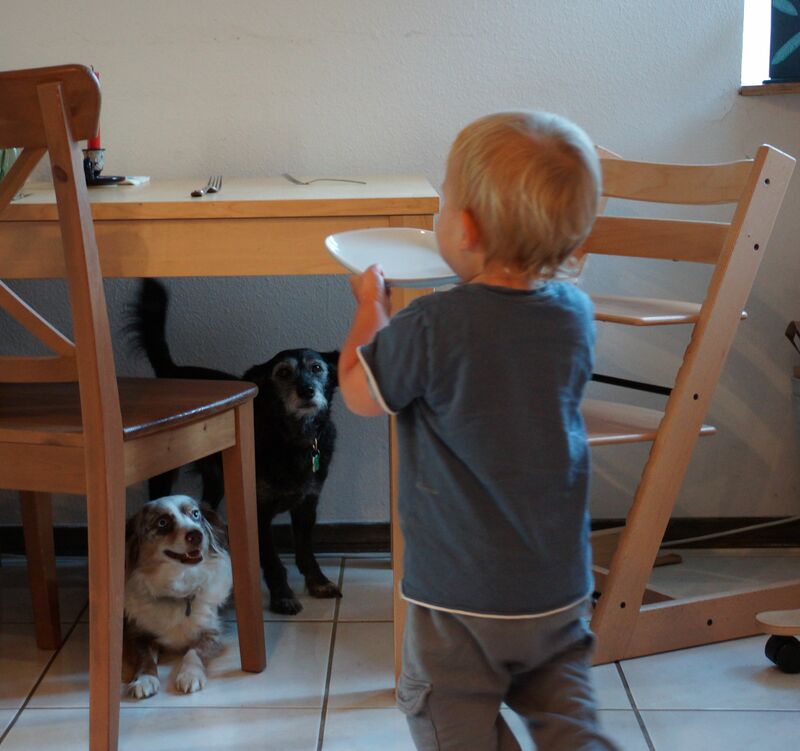 Now, all mom has to say is: “It’s time to eat!” and I run to my table, pull out my chair, and sit down on my own! 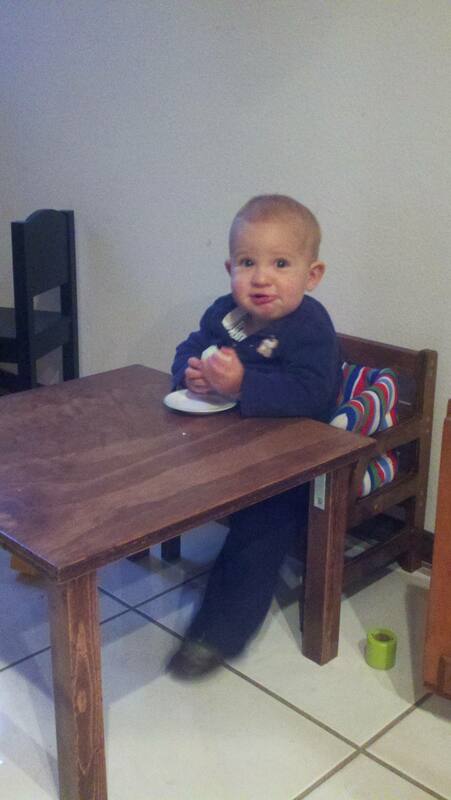 Sometimes I share my weaning table with my friend James. We have so much fun eating lunch together! My dad and my aunt Debbie made the weaning table from plywood he had lying around in the basement. They also built my Learning Tower, which we move into the kitchen when I need to wash my hands or help with the cooking. I hope one day I can be as crafty as they are. I have breakfast and dinner with mom and dad at the dining room table. I have a Tripp-Trapp chair that was a present from my grandparents, aunt, uncle, and cousins. I love knowing that my entire family has contributed to my independence. I am learning to climb in and out of the chair on my own, and it’s so nice to share meals with mom and dad. We always light a candle and use real china, silverware, and glasses. I love feeding myself, which can get a little messy but it’s also a lot of fun. I’ve broken a couple of glasses and plates, but now I have a lot of respect for them. I am so careful, that now I am in charge of taking the plates and silverware to the table when it’s time for dinner! OK, moving along… Squeeze by the couch and follow me outside. Here are my geraniums, which I water every day (I’m working on getting more water into the pots and less water on the floor). Over there is my water source, and my watering can. I quickly learned how to get water to come out of the spigot, and now I can fill my own watering can. My mom put a large container underneath to catch spills, and an old cooling rack serves as a surface for resting my watering can. I also have a pot with a lot of dirt, and an almost-empty pot that I am slowly filling up with dirt and toys and pinecones and rocks and everything else I find in the patio. My mom always says that she needs to “put more work into the outdoor environment”, but actually this is my favorite spot in the entire house! Let’s come back inside. Careful with those steps, you might want to hold on to the low railing my dad installed so I could go up and down the steps on my own. This way, I can get to the bathroom when I have to use the potty. Here’s my little toilet; I have another one upstairs. Here are my underwear and my books. Mom and I spend a lot of time here, reading books, singing songs, and waiting for me to do my business. When I pee or poop, I proudly empty my potty into the toilet on my own, while my mom flinches and tries to pretend like she’s not dying to help me. Oh, look, right outside the bathroom is the dogs’ water bowl. 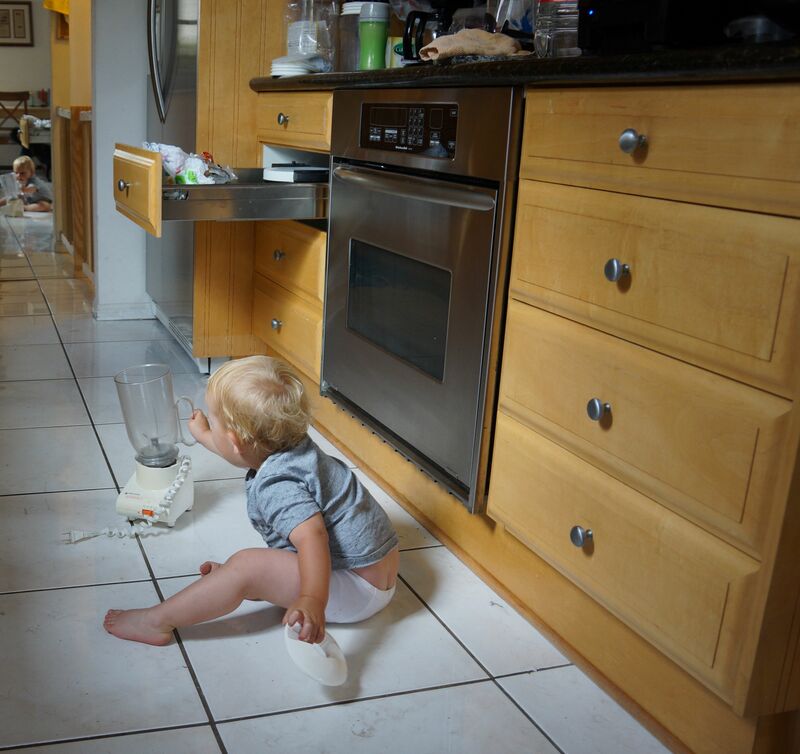 I used to make a giant mess every time I walked by – I couldn’t resist turning over the bowl and spilling the water everywhere! I’m much more mature now; I notice when it’s empty and take it to my mom so she can fill it up. She didn’t understand me the first time I took it to her and said “agua“. She told me, “No, there’s no water in the bowl right now”. Moms can be so dense! I persisted, and eventually she understood and got really excited at my new “level of awareness”, which is what she called it when she told daddy. Call it whatever you want, mom, but someone had to give the dogs water! Let’s go upstairs. Mind the gate at the bottom of the stairs, which nowadays is only used for keeping the dogs downstairs. We still use the one at the top of the stairs when mom has to take a shower and I am hanging out upstairs. Here’s my bedroom. I slept on a floor bed for many months. It was a crib mattress placed on the floor, and I really enjoyed the freedom it gave me to explore my room after my nap or if I wasn’t feeling sleepy. Unfortunately, I am a big-time roller, and in the winter I would roll out of bed and get very cold sleeping on the wood floor. My parents found the perfect solution: this neat bed from IKEA! Instead of using slats to raise the mattress off the floor (like the original design intended), my dad came up with the idea of putting the mattress on the floor so that there would be a low wall surrounding it. There’s a little entry/exit built into one end of the bed’s frame, but I’m also really good at climbing in and out the side of the bed (I landed on my face the first few times I tried this, but now I’m a real pro). Next to the bed is my stool and my laundry hamper. Mom says I’m a wiggle worm; she tries to get me to sit down to get dressed, but I often end up running around the room half-naked. However, I do love to put my dirty clothes into the hamper! In the upstairs bathroom I have a stool to reach the counter so I can brush my teeth, and I also have another potty like the one downstairs. In my parents’ room I have a few toys on a shelf, which I mostly use only when mommy is getting dressed. This was my movement area when I was younger; I had my mobiles, mirror, and a bar for pulling up and cruising. We’ll soon turn it back into a climbing wall so I can give mom more heart attacks start bouldering! Well, that’s it, folks! I hope you’ve enjoyed the tour of our Montessori home… Thanks for visiting, come back soon! May 10, 2013 May 10, 2013 Pilar B.
bored toddler + chopped kale = practical life heaven! I told him I needed his help, put him in the tower and helped him to wash his hands. Then I put the kale in a bowl and showed him how to transfer it to the pot. I stood back and let my little chef get to work. Pure bliss for both of us! PS: I know I should make him an apron. It’s on my to-do list entitled “Things to make at 3am when I can’t sleep because I’m thinking of everything I have to do“. April 23, 2013 Pilar B. Parents who are new to Montessori often observe a classroom and think: “My child would never fit in. He’s not capable of doing what those children can, or of behaving like those children do.” I want you to know that, although all children develop at their own pace, your child CAN become self-sufficient at an early age. Why is this important? Because research confirms that children whose independence is supported feel capable of dealing with life’s challenges, have a higher sense of self-worth, and tend to have a more intrinsic motivation to learn. Remember, too, that it’s never too late to modify your approach if you realize you have been holding back your child. You might get some resistance at first, but if you know what every child is capable of, it will be easier for you to transmit trust and confidence to your child. When a baby is born, she is all but helpless. It takes days, weeks, and months before she learns to control her own movements, reach and grasp, and walk on her own. In her early weeks and months, your job as her parent is to keep her safe, to tend to her needs, to comfort her when she cries, and to be patient – very patient. But as she grows into toddlerhood, you may be surprised at how much she can do that can help her develop a sense of capability. On the other hand, if you do too much for her (in the name of love), she is likely to form the belief that she is not capable… Words alone are not powerful enough to build a sense of competence and confidence in children. Capability comes from experiences of accomplishment and self-sufficiency, and from developing solid skills.